Primed and sanded wood panels. As I begin my large scale paintings a ticker tape of adages run through my head "there are no small ideas, leave it all on the floor (er...panel), go big or go home" peppered with an excitement and desire to just get at it. Ink drawings. April 22nd and 14th, 2013. Domino Drawing Project. 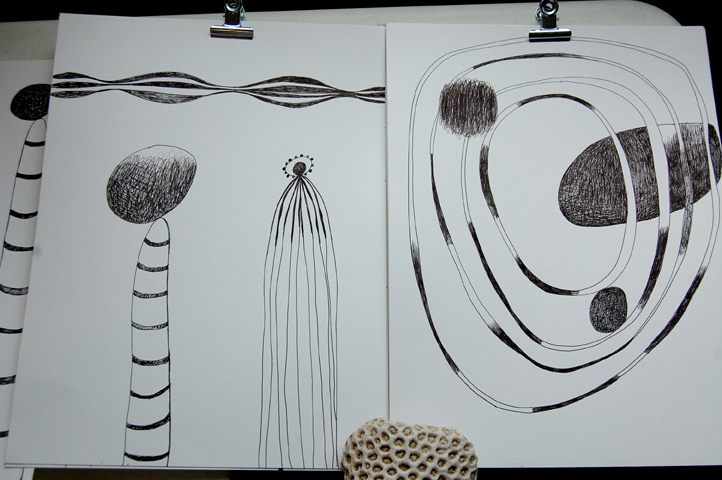 I cull through my drawings for shapes to enlarge and relationships between the forms that interest me. At this early stage I'm working out scale and experimenting with the density and layering of forms.